If BR is really a messenger in the GA action sequence or vice versa, their levels should rise and fall together. Darkened plants should have high levels of BR, well lighted plants, low levels. Like abundance signals BR may be mostly made in meristematic cells and much less so as cells mature. (Or for real theoretical beauty, deficiency hormones should be made mostly in mature cells and much less so in meristematic cells). BR should be made when a cell has less than enough sugar to support both it any cell dependent on it for sugar acquisition. Thus BR is an indication that sugar exists in less than enough amounts to continue the plant at its current size, thus the plant must use emergency stores of starch, find new sources of the molecule and cut down on its sinks. High levels of exogenously applied BR should induce JA synthesis, because many of BR's effects may be to increase sugar levels within the plant, if only temporarily. This may include making dormant reactions that normally depend on sugar. should brassinosteroid inhibit and stimulate? BR should encourage shoot and new shoot growth, but inhibit root growth and even encourage root senescence. This may be a particularly apparent when ethylene levels are high and strigolactone and ABA levels are low and levels low as this is an indication that resources need to rerouted from the root to the shoot and ABA levels are low and levels low as this is an indication that resources need to rerouted from the root to the shoot. BR should cause the emptying of stored sugar reserves found in vacuoles or tubers. Sugar deficiency, on average should be detected in the roots first, the point furthest from the source of sugar. BR may be transported from the roots to the shoots where presumably they repel sugar and send it in the opposite direction back to the low sugar roots. brassinosteroid affect attraction and repulsion? BR should generally push all nutrients and abundance signals/hormones out of cells. BR should attract the deficiency signals/hormones, ABA, ET and strigolactones, leading to positive feedback and cell senescence. BR should perhaps also work with JA to attract nutrients and positive hormones to leaves that are making jasmonic acid and thus are efficient synthesizers of sugar. If overall speculative role is true, how should brassinosteroid affect apical dominance? BR should break shoot apical dominance because low sugar levels are an indication of poor performance by the currently dominant apical shoot. BR may strengthen the currently dominant root apices in order not to encourage any new root growth which would be a further sink on sugar levels. should brassinosteroid affect Cell Division? Although it may encourage cell division in the shoots, if it is inducing new ones, BR should generally inhibit cell division, as a sugar deficient plant is in no condition to expand. Just as I am hypothesizing that SA, JA, IAA and CK all need to be present to induce cell division, ABA, GA/BR, ET and strigolactone may all need to be present for cell senescence to proceed. may all need to be present for cell senescence to proceed. BR should encourage senescence, particularly of root tissue whose nutrients can be cannibalized and used to make more sugar producing shoot and leaf tissue. BR should lengthen leaves and stems like GA. Presumably stem lengthening accomplishes moving shaded plants back into the sunlight. From Wikipedia - "One well-supported hypothesis is that all tissues produce BRs, since BR biosynthetic and signal transduction genes are expressed in a wide range of plant organs, and short-distance activity of the hormones also supports this." 96 97 Why this makes sense - GA may be made in just meristematic or for more theoretic beauty, in just senescent cells. Whereas GA is transported all over the plant and acts locally through BR. From Wikipedia - BR is transported acropetally (upward). 96 Why this makes sense - Sugar deficiencies are detected in the root and transported to act in the shoot. Promotes epinasty through synthesis of ethylene. 63 Why this makes sense - GA/BR initially causes the release of stored sugar which increases metabolism, using up oxygen and causing rises in ethylene. BR inhibits leaf abscission . 98 Why this makes sense - BR being part of the sugar deficiency signal, would like to preserve as many apparatuses of sugar synthesis (leaves) as it can. Plants found deficient in brassinolides suffer from dwarfism. 99 Why this makes sense - is part of the same pathway that produces dwarfism in gibberellin mutants. 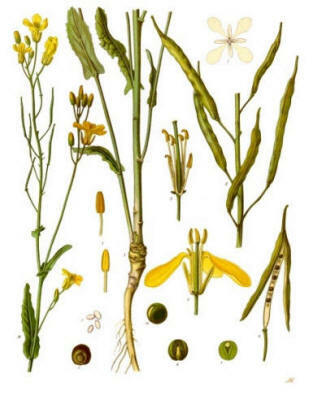 GA/BR is probably used by a plant to lengthen it's stem during dark periods, fueled by dissolving of stored starch. From Wikipedia - "Promotes cell expansion and cell elongation; works with auxin to do so." 98 103 Why this makes sense - BR's complement is jasmonates which presumably initiates cell and tissue broadening. BR mirrors gibberellin's broadening. From Wikipedia - "Acceleration of senescence in dying tissue cultured cells; delayed senescence in BR mutants supports that this action may be biologically relevant." 98 Why this makes sense - presumably tissue already slated to senesce is in the positive feedback loop discussed previously as existing for all deficiency hormones once beyond hibernation "valley" levels. From Wikipedia - Provides protection to plants during chilling and drought stress. 96 Why this makes sense - BR presumably initially frees up stored sugar which allows for greater metabolism which itself liberates heat and water. Low levels of BR promotes root lengthening independent of auxin and ethylene. 51 Why this makes sense - the release of stored starch may temporarily allow for the release of root growth if it is limited by sugar levels. Higher BR levels inhibits root growth. 51 Why this makes sense - a plant facing sugar deficiencies need to inhibit root growth. Enhances seed germination although apparently not by the same pathway as GA. 101 Why this makes sense - ? just as GA enhances seed germination BR should also, by releasing stored starches found in the seed. This conflict may be resolved later or perhaps has already been resolved. Of course I'm probably oversimplifying in this whole effort too. Promotion of vascular differentiation; BR signal transduction has been studied during vascular differentiation. 100 Why this makes sense - xylem differentiation doesn't make too much sense, but phloem differentiation would bring needed sugar down to sugar deficient roots. "Inflorescences treated with brassinolide alone had no effect on ethylene production. However, when brassinolide was used in combination with IAA there was a dramatic increase in ethylene production above the induction promoted by IAA alone." 104 Why this makes sense - IAA causes increases in respiration as it is an indicator of oxygen surplus. Once ethylene is produced, it starts pushing out nutrients. Adding BR is like adding fuel to the fire and leads to a climacteric export of all nutrients including oxygen thus leading to an even greater evolution of ethylene.